Your privacy is important to All Star Software Systems. This statement discloses the information practices for All Star Software Systems Web sites, including what type of information is gathered and tracked, how the information is used, and with whom the information is shared. All Star Software Systems abides by the Safe Harbor framework as set forth by the United States Department of Commerce regarding the collection, use and retention of information collected from the European Union by a Web site on the AllStarSS.com domain. In summary, All Star Software Systems respects your privacy and will never share any information you provide with a third party unless expressly authorized. Personal information, such as email, phone, fax and addresses will be used only be used in the context it was provided. In general, you can visit All Star Software Systems on the Internet without telling us who you are and without giving any personal information about yourself. You may choose to give us personal information in a variety of situations. For example, you may want to give us information, such as your name and address or e-mail id, to correspond with you, to process an order, or to provide you with a subscription. You may give us your credit card details to buy something from us or a description of your education and work experience in connection with a job opening at All Star Software Systems that you wish to be considered for. The following paragraphs describe in more detail how All Star Software Systems may use your personal information and with whom we may share it. Depending on the type of All Star Software Systems Web site you are visiting, one or more of the paragraphs may apply. For example, if you order a product from an All Star Software Systems Web site, your information will be handled as described in such paragraphs as Fulfilling Your Transaction Request and Marketing Use. If you request something from an All Star Software Systems Web site, for example, a product or service, a callback, or specific marketing materials, we will use the information you provide to fulfill your request. To help us do this, we may share information, with other divisions of All Star Software Systems. In connection with a transaction we may also contact you as part of our customer satisfaction surveys or for market research purposes. The information you provide to All Star Software Systems on certain All Star Software Systems Web sites may also be used by All Star Software Systems for marketing purposes. Before we use it, however, we will offer you the opportunity to choose whether or not to have your information used in this way. For example, after purchasing a product, you may be asked if you wish to receive product updates and bulletins via email. While we encourage the use of email as a mechanism of product update notification, it is not necessary or required for the transaction. In connection with a job application or inquiry, whether advertised on an All Star Software Systems Web site or otherwise, you may provide us with information about yourself, such as a resume or professional references. We may use this information throughout All Star Software Systems and its related entities for the purpose of employment consideration or your inquiry. Except where you tell us not to, we will keep the information for future consideration. If you participate in an All Star Software Systems discussion forum or chat room, you should be aware that the information you provide there will be made broadly available to others, potentially inside or outside All Star Software Systems, who have access to that discussion forum or chat room. Also, please recognize that individual forums and chat rooms may have additional rules and conditions. Each participant’s opinion on a forum or chat room is his or her own and should not be considered as reflecting the opinion of All Star Software Systems. In some cases, specific All Star Software Systems Web sites may contain other notices about their use and the information practices applicable to those sites. All Star Software Systems web store products may be purchased world wide. As such, our privacy practices are designed to provide protection for your personal information, all over the world. Some countries may provide less legal protection for your information. In such countries All Star Software Systems will still handle information in the manner we describe here. From time to time we may supplement information you give us via an All Star Software Systems Web site with information from other sources, such as information validating your address or other available information about businesses. This is to help us maintain the accuracy of the information we collect and to help us provide a better service. We sometimes collect non-identifiable information from visits to our Web sites to help us provide better customer service. For example, we keep track of the domains from which people visit, and we also measure visitor activity on All Star Software Systems Web sites, but we do so in ways that keep the information non-identifiable. This information is sometimes known as “clickstream data” or passive information. All Star Software Systems or others on All Star Software Systems behalf may use this data to analyze trends and statistics and to help us provide better customer service. Certain Web transactions may also involve you calling us or our calling you. Please be aware that it is All Star Software Systems general practice to monitor and in some cases record such calls for staff training or quality assurance purposes. All Star Software Systems Web sites may contain links to other Web sites. All Star Software Systems is not responsible for the privacy practices or the content of those other Web sites. This privacy statement was last updated on December 9, 2009. A notice will be posted on our Web site home page for 30 days whenever this privacy statement is changed in a material way. If you have a question about this statement, you can send an email to the All Star Software Systems Web site coordinator. Click here or call 860 613 1500. You can also contact us at this address if you have a question about our handling of your information. 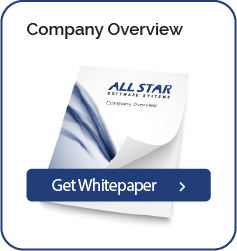 If you wish to obtain a copy of particular information you provided to All Star Software Systems, or if you become aware the information is incorrect and you would like us to correct it contact us at http://www.allstarss.com/contact or call 860-613-1500. Before All Star Software Systems is able to provide you with any information or correct any inaccuracies, however, we may ask you to verify your identity and to provide other details to help us to respond to your request. We will endeavor to respond within an appropriate timeframe.